Every summer since 1962, people have gathered from across the United States to share a unique celebration of rustic forest living and learning about dance cultures from across the globe. Folklore Camp is a retreat from the stress of urban life and daily routines. Folklore Camp’s Workshops offer a wide variety of both formal and informal learning opportunities, taught by a talented, knowledgeable, world-class teaching staff. Our workshops offer INTERNATIONAL dance, instrumental and vocal techniques with a particular slant towads the Balkans and Europe. Unique to Folklore Camp are our cultural Happy Hour Celebrations, where teachers share their countries folklore and traditions. With a camp size of about 100, we offer and inclusive, intimate and supportive atmosphere in which to learn. We welcome both beginners (with little or no previous knowledge) and advanced levels (with years of experience) to our workshops! Five dance classes are offered DAILY: Three classes with instruction presented by teachers who will be sharing their country’s dances and regional styling; And the other two will be a mix of beginning Folk Dance classes (instruction in basic folk dance technique and beginning folk dances); and more advanced Folk Dance classes (presenting more difficult styles and complicated patterns). We offer two singing classes daily of International folk songs that are taught at varying levels. Teachers focus on vocal production, technique, ornamentation and regional styling. There are also Kafana sing-alongs, and group singing with the band during the evening dance parties. Four instrumental workshop classes daily, primarily relating to the dance genres being taught, but can include many other cultural traditions. During our camp week, we offer a few "family friendly" outings with the Woodlands' Park Naturalist. Which can include early morning bird watching, field trips to the rocky shoreline for tide pooling, hike to Big Tree (old growth), Campfire Cooking for Kids (the art of building a fire and cooking kid-friendly food over an open flame) and star gazing in the meadow... just to name just a few. 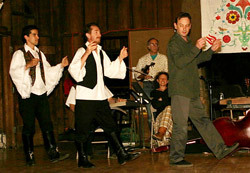 IN GENERAL - Mendocino Folklore Camp Activities can include: exploring a path through a redwood grove, attending world dance and music classes, sitting by the lodge's fireplace and reading, crafts, a trip into town for browsing or shopping, board and card games, swimming in the creeks, driving to the ocean, relaxing, cocktail hour, special events, superb international dance bands, and evening dances. 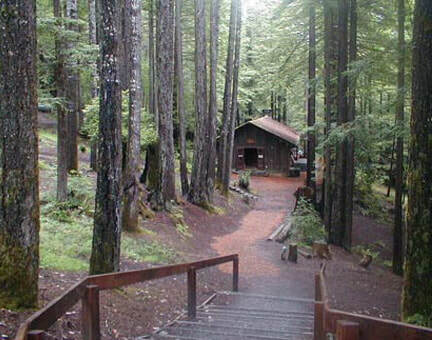 The Mendocino Woodlands, a National Historic Landmark Camp, is in a 720 acre redwood forest nine miles inland from the charming village of Mendocino on the spectacular California coast, about a four hour drive north of San Francisco. The Woodlands were a WPA project of the 1930s.